After all the waiting, all the reading, all the lectures, and all the planning it's hard to believe that June 8th has come and gone. I'm just glad all the effort wasn't for nothing. I successfully observed the Transit of Venus! My Venus Transit adventure began on Saturday, June 5 when Rich Mather came to pick me up in his Honda Odyssey mini-van. After loading all my equipment and making sure my “Transit of Venus or Bust” sign was securely attached to the rear window, we “set sail” for the east coast at 10:47 am EDT. With the wind on our backs, we sailed through Canada, New York, and most of Massachusetts in about 12 hours. After docking the Odyssey for the night at a motel in Springfield we resumed our voyage. We reached our destination, Portland, Maine on Sunday, June 6th at 2:45 pm EDT. Our first task was to search for a library or some other spot with internet access to check the weather. It was very cloudy in Portland that day, but I wasn't concerned. I had been closely monitoring the weather for at least 3 weeks before the transit. My first choice was St. John's, Newfoundland, but all the forecasts predicted cloudy skies on June 8th. Anywhere between Portland and Atlantic City, New Jersey was looking ideal. Maine was the obvious choice because the further north and east you went the more of the transit you'd get to see. We sure did pick an odd time to arrive in Portland. The “Old Port Festival” was being held that day, so many of the city's interior streets were blocked off and filled with thousands of people. Rich and I decided to leave the Odyssey and find our way around town by foot. We decided to ask the owner of a small furniture store for directions and she provided us with a map and lots of good information. It turned out that the library was closed (it was a Sunday), but there was an internet café nearby. Thanks to the map, we quickly tracked it down and logged onto the internet. The weather forecasts were still predicting clear to partly cloudy skies for Portland on Tuesday morning. After enjoying the Old Port Festival for a while, we decided to find a place to stay; making sure to enjoy the sites along the way. We found a pretty nice motel in a small town called Scarborough and settled in for the night. I made sure to bring along my laptop and some local phone numbers from my ISP allowed me to get back on the internet to keep an eye on the weather. Rich called Bill Nigg on his cell phone and it turned out he was just south of us in York Beach. We got an early start on Monday morning and our task for the day was to scout out observing locations. Slowly, we made our way down the coast of Maine. The first two spots that caught my eye were Two Lights and Crescent Beach State Parks. Both were inaccessible at night and didn't open their gates until well after the transit was over. There was a good spot next to Two Lights, so we put that on the list. We also checked out York Beach and found another spot right on the ocean. The weather that Monday morning was still looking gloomy, so Rich tried calling Bill several times throughout the day without success. My weather radio said that “tenacious clouds” were hanging over our area, but that northern New Hampshire was enjoying sunshine. It also started reporting early morning fog, so we knew we'd better start looking for higher elevations We decided to head to Portsmouth, NH where they were indeed in the sun. Time was running out, so Rich decided to call Bill again from the Portsmouth Library. Finally, he answered his phone and he found a good, high spot near Cape Neddick, Maine. 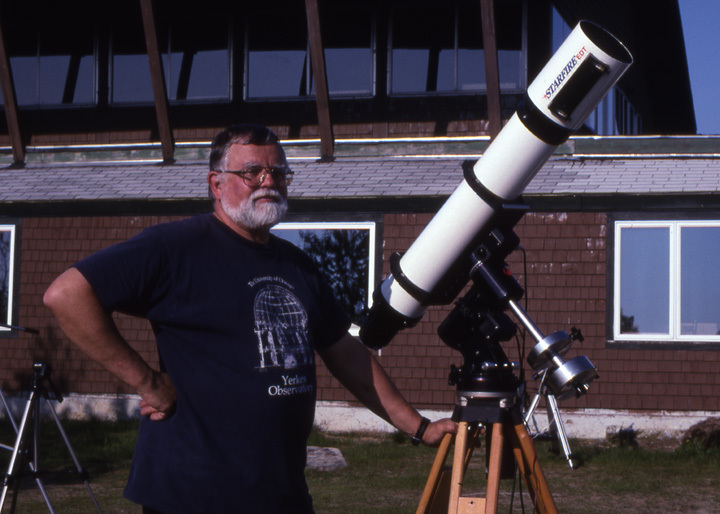 So, Rich and I headed north back into Maine again and met up with Bill and his wife Mary on the top of Mount Agamenticus (Latitude: 43° 13' 25" N, Longitude: 70° 41' 29" W). After getting a quick bite to eat in York Beach, we headed back up to Mount A and I set up my equipment. The fog started rolling in off the Atlantic Ocean just as I finished. I was hoping to polar align and collimate my scope, but the fog became too thick. So, everyone tried to get some sleep. Bill and Mary were comfy in their camper and Rich lied down in the back of his van. I just crashed in the front passengers seat knowing that I wouldn't get a wink of sleep. So, I just sat awake the entire night waiting and thinking. I thought about Abbé Jean-Baptiste Chappe d’Auteroche, who was also unable to sleep the night before the 1761 transit. He sat up the entire night “worrying about every distant cloud or smoke curl from a fire.” He had less to worry about though. The fog kept getting thicker and thicker and before too long I was unable to even see outside the windows of the Odyssey. Around 4:00 am I heard Bill knocking at the window telling us to wake up. I told him I wasn't asleep, but he didn't believe me! I glanced out the window and actually saw a few stars in the sky. When I got out of the van I spotted the Waning Gibbous Moon with a nice halo around it. The air was still pretty foggy, but it was slowly improving. Sunrise for our location was at 5:04:57 am EDT. So, we decided to have breakfast while we waited for the sun to rise. The fog from the Atlantic finally cleared out around 30 minutes before sunrise, but then more fog rolled in from the north! It never managed to get very dense though because a warm breeze came in from the opposite direction and cleared everything away. It was truly astonishing! As the eastern sky grew brighter it seemed to explode in a brilliant orange glow. You could then see the fog draped below us as far as the eye could see. As the Sun slowly rose, the gray fog was replaced by a magnificent orange carpet of clouds. It was one of the most beautiful sites I think I've ever seen. It was finally safe enough to remove all the covers and caps off my equipment. When I removed the dust cap off the front of my 10” Schmidt-Cassegrain I discovered some moisture on the corrector plate. The only way to get it off was to wait for the sun to get high enough and let it evaporate naturally. Next time I’ll bring a hair dryer! While I waited I searched for Venus with a pair of eclipse glasses. I was amazed at how easy it was to spot. Once my corrector plate cleared up I put my Baader solar filter on the 10” and then attached my Coronado SolarMax 40 Hydrogen Alpha filter to my Tele Vue Pronto 70mm f/6.8 refractor. I suppose I can consider myself one of the first people (of thousands) to see the Transit of Venus in H-alpha. I didn't see any major prominences that day, but Venus appeared blacker through the H-alpha filter than it did in the white light filter. 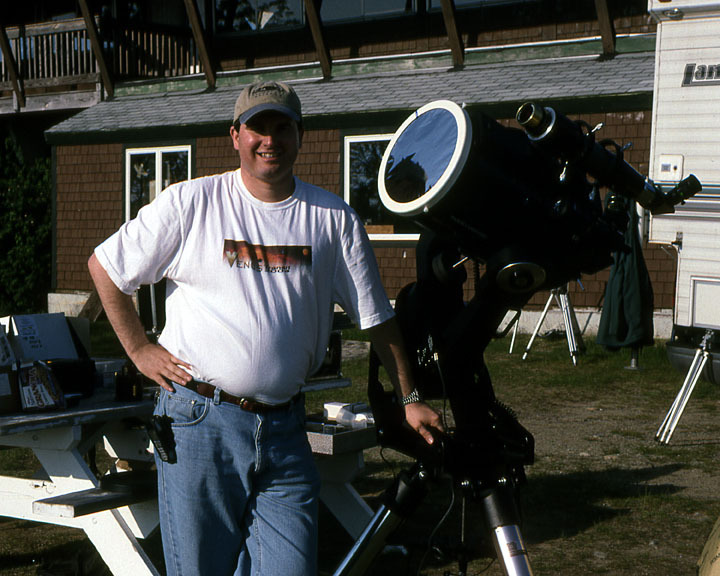 After everyone got a peak at the transit in H-alpha I attached my Philips ToUcam to the Pronto and my 35mm SLR camera to the SCT. I used my Lumicon Giant Easy Guider (with built in focal reducer) to photograph the Sun at f/6.3. Mainly, the light meter in the camera helped me with the proper exposure, but I made sure to bracket just in case. Imaging with the webcam turned out to be problematic for reasons I'm still confused about. There was an abnormal amount of static on the screen of my laptop. I've had several months of experience imaging the Sun, Moon, and planets and never saw this before. My best guess to the source of the interference were the multiple cell phone towers on top of Mount A, but maybe I’ll never know for sure. I played animations of the transit multiple times using the Venus Transit freeware program from the Dutch Occultation Association, but that could never substitute witnessing one of astronomy's rarest spectacles first hand. Its unfortunate Venus transits are so rare, because it was so much fun to observe. After taking all my pictures I wanted to put the eyepieces back on and watch the final minutes of the transit firsthand. Contact III occurred precisely at 7:05:41 am EDT and Contact occurred at 7:25:38 am EDT; although I was able to observe the transit for another 3 minutes or so in H-alpha. The Transit of Venus was now over – not to return until June 5, 2012. I'm already making my plans! I slowly packed up all my gear and then took a quick tour of Mount A and then Rich and I began the long trip home. While crossing through Canada we watched the sunset, which I found both ironic (since we watched the sun rise) and fitting, since it was a perfect end to a historic day.